Water Quality in Singapore: What have I been up to? 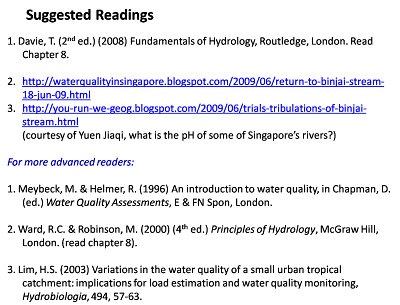 Guess what, I found out from Serene (thanks for the tip) that my blog (ok, 1 particular post) is featured in the reading list of a NUS geography module, GE2229, Water and the environment. How interesting!